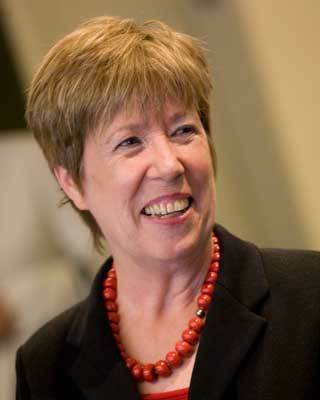 Nell Jessup Newton became Notre Dame Law School’s tenth dean on July 1, 2009. Newton came to Notre Dame from U.C. Hastings College of Law where she was the Chancellor & Dean and William B. Lockhart Professor of Law. Previously she served as dean at the University of Connecticut School of Law and later at the University of Denver College of Law. Newton taught Contracts, Property, Constitutional Law, and American Indian Law at Catholic University Law School (1976–1992) and then at American University Law School (1992–1998). From 1990 to 1997 Newton also taught at the Pre-Law Summer Institute for Native American Students (PLSI) at the University of New Mexico in Albuquerque, New Mexico. Newton is a leading scholar of American Indian law, especially as that field intersects with federal constitutional and property law, writing frequently cited law review articles on tribal property rights and rights to self-government. She was the co-author of the third edition of one of the leading textbooks on Indian Law, Cases & Materials on American Indian Law, and is the editor-in-chief of Cohen’s Handbook of Federal Indian Law, the only treatise on the subject. Her many law review articles have been reprinted in scholarly books on Indian law, race law, the law of reparations, and legal philosophy. Newton earned her bachelor’s degree from U.C. Berkeley in humanities with an emphasis on ancient Greek, and her law degree from U.C. Hastings, where she was elected to the Thurston Society and the Order of the Coif and served as managing editor of the Hastings Law Journal. She is active in scholarly and educational organizations, such as the American Association of Law Schools, the American Bar Association, and the Law School Admissions Council. She is a director of the National Association of Law Placement Foundation and is a life fellow of the American Bar Foundation and the Connecticut Bar Foundation. She also served as an associate justice of the Yurok Tribal Supreme Court in 2008–2009.